On the 10th of January of this year, we were contacted by Cheythan Sathya from Canada, who said he was a so-called medical doctor “Fellow in Global Journalism”. This was apparently for an article based on interviews with experts, to be published on CNN. 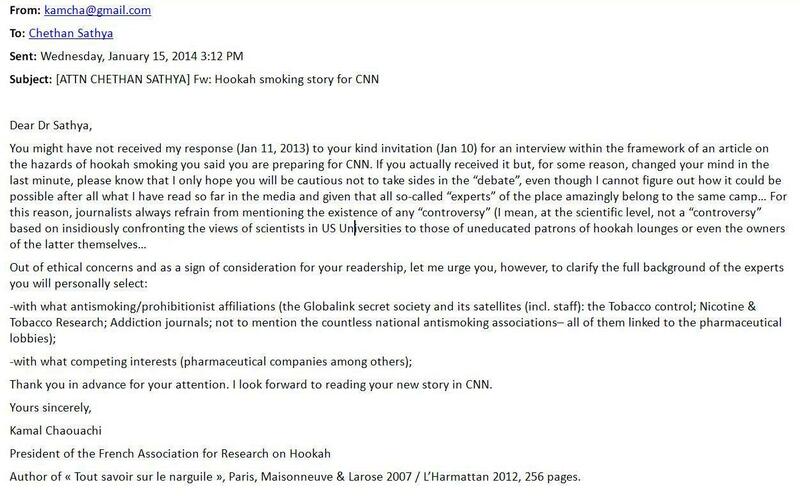 He said he already wrote a previous paper in CBC on the issue of hookahs . We immediately realised that the latter paper was based on a pseudoscientific study prepared by renowned members of the 6,000 member Big Pharma Globalink secret society (intranet), “Tobacco “Control”” and US-University of Beirut ‘s individuals like Fadi Hammal, Alan Shihadeh and Roberta Ferrence . The aim was to attack the economic and cultural activity of Canadian lounges where herbal moassel (tobacco-free smoking mixtures) was still in use in spite of strict bans. From the very beginning, we felt it smelt like a set-up. 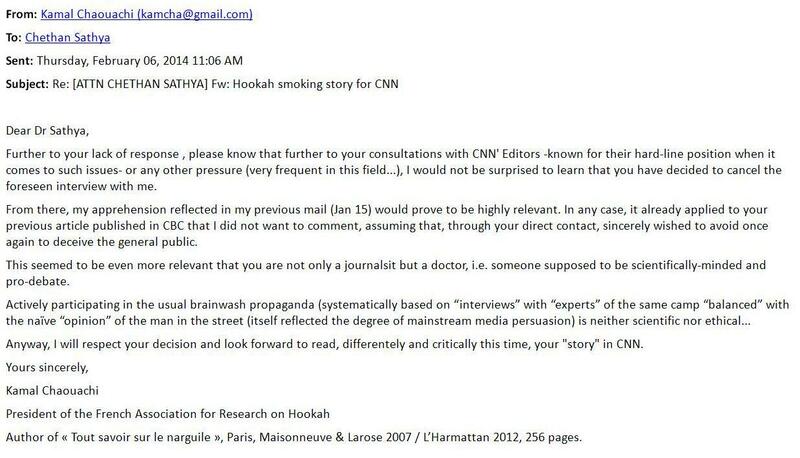 For instance, the insidious title of the CBC paper would mean that the exaggerated (and oftern just invented) so-called hazards of hookah smoking do “justify” strict bans when, in fact, this is all pseudoscience, institutionalised pseudoscience disseminated thanks to the collusion of mainstream media and corruption of the “peer-review” process in biomedical journals thanks to financial pressures from Big Pharma (nicotine patches, gums, etc. and other “quit” medicines). All the so-called “studies” (see examples on this site, particularly the one published in Cancer Epidemiology) are based on methodological tricks, sleight of hand procedures (e.g., not changing the water between two sessions, making the tobacco/molasses smoking mixture burn instead of just being roasted or vapourised, etc.) that, obviously, the average citizen cannot understand from the outset . Out of our past experience with such individuals, we can say that fresh holders of medicine diplomas, who are not talented or cannot find a job, sometimes try their luck as “medical” or “public health” scribblers for such mainstream media as CBC News, CNN News, Forbes, etc… A previous pitiful example is Dr Robert Glatter with his “public health” Forbes story . Sorry for delay in replying but have been away from the computer for a week….. but here we go my frien! You see how simple the answer is Chethan? Those that do not smoke, or do not wish to be anywhere near SHS would not dream of entering such a premises, which is perfect as it then leaves the shisha/hookah lounges unoccupied for those who do wish to smoke. It is called CHOICE Chethan and people should have the freedom of choice. Those who wish to enjoy a social drink in a non smoking environment simply got to a non smoking establishment. Why do businesses need to ‘go under’ because of the most discriminatory law ever? Would a non drinker who cannot abide the smell of intoxicating beers/spirits enter a drinking parlour? I don’t think so, they would choose to avoid the place and socialise elsewhere. Would someone with a fear of heights start climbing mountains or tall buildings…..I don’t think so! Would a claustrophobic person go caving…..I don’t think so! So the answer is very, very simple Chethan….. IF YOU CAN’T STAND THE HEAT MOVE AWAY FROM THE FIRE! You then ask about ‘making a premises safe for employees’? Again, with great respect, how absurd a question is that Chethan? Why would any non smoking chef/waitress want to work in a smoky environment in the first place? All the shisha lounges that I know of only employ those who enjoy shisha smoking-that is why they choose to work there in the first place. Chethan Sathya. Nearly 1 in 5 high school seniors have tried hookah. CNN, 7 Jul 2014. Hammal F, Chappell A, Wild TC, Kindzierski W, Shihadeh A, Vanderhoek A, Huynh CK, Plateel G, Finegan BA. ‘Herbal’ but potentially hazardous: an analysis of the constituents and smoke emissions of tobacco-free waterpipe products and the air quality in the cafes where they are served. Tob Control. 2013 Oct 15. doi: 10.1136/tobaccocontrol-2013-051169. Chaouachi K. Letter to Dr Donald Gardner (Editor-in-chief Inhalation Toxicology journal) dated 7 Dec 2010 and Correspondence. Online Dec 16, 2010.